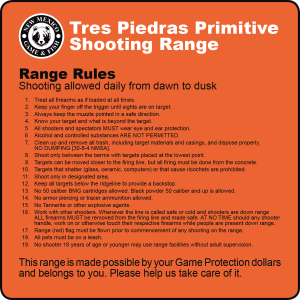 The department recently opened the Tres Piedras Primitive Shooting Range located 3 ½ miles west of Tres Piedras on commissioned-owned property. The Tres Piedras Wildlife Management Area is approximately 3,200 acres purchased in 1940 to provide a restoration area for sage grouse and pronghorn. The department developed a 200-yard, 10 firing-point range on the property to provide area hunters and out-of-state hunters a place to sight-in their rifles before they venture out into the field. The range is open seven days a week from dawn to dusk. It is unmanned; therefore, shooters must coordinate with each other.